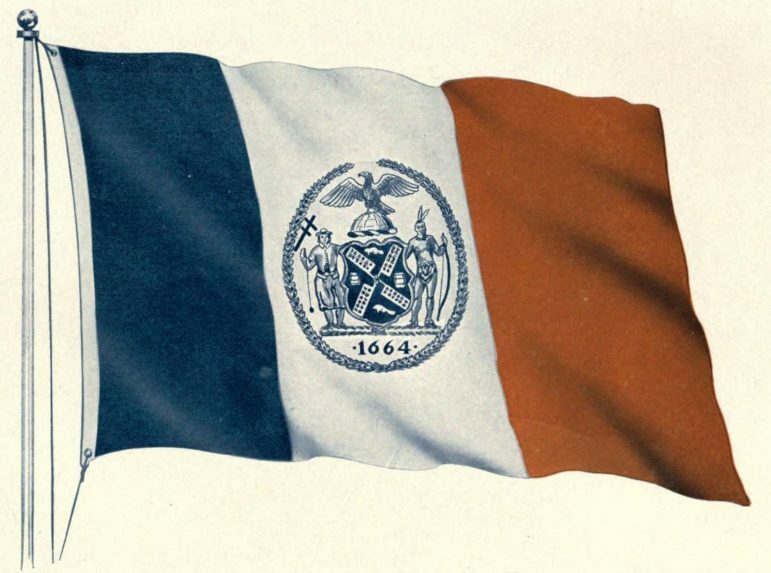 This is the first official flag of the City of New York, adopted in 1915. Joseph P. Viteritti is the Thomas Hunter Professor of Public Policy at Hunter College and most recently author of The Pragmatist: Bill de Blasio’s Quest to Save the Soul of New York (Oxford). He was a consultant to the historic 1989 charter revision commission and research director for the 2010 commission. This is his first in a series of essays about the opportunities and risks New York City encounters as it considers a landmark rewiring on its government. More than some 250 years ago, Montesquieu, the French philosopher whose writing informed the crafting of the American republic, wrote that constitutions are more than legal documents. In his words, a constitution must represent the “spirit” of the people, reflecting their history, traditions, values, and aspirations. A city charter is the closest thing a municipality has to a constitution. It assigns authority and responsibility to public offices and defines processes through which these offices are held accountable by the people. This year, the New York City charter is undergoing its most comprehensive review in 30 years. In 1989, voters approved proposals put forward by a commission appointed by Mayor Edward Koch that eliminated the once powerful Board of Estimate, an executive body that had discretion over the city’s capital and expense budgets, land use, contracts and franchises, thereby completely refashioning the government. While the current commission appointed by the Council speaker, public advocate, comptroller, borough presidents and mayor is unlikely to propose anything so profound, its promise of a thorough review provides us with an occasion to ask some fundamental questions about the charter’s purpose and meaning. In order to understand it, we must look back into history and the evolution of the institutions themselves. The 1989 charter is a good place to start. The Board of Estimate of 1989 was composed of the five borough presidents and three citywide officials: the mayor, the president of the city council, and the comptroller. It had its origins in 1901, three years after the independent cities of Brooklyn and New York were consolidated with the small towns scattered across Queens, Staten Island and the Bronx to form New York City as we know it today. A coalition of Republicans and Brooklyn Democrats unhappy with control of City Hall by Manhattan Democrats demanded a new charter that better represented the interests of the outer boroughs. That uprising and the existence of the board in various forms for nearly 90 years served as an early declaration of how seriously New Yorkers from outside of Manhattan take their borough identity. The board’s demise came about when a federal court, and eventually the U.S. Supreme Court, ruled that granting equal representation on the board to the five boroughs violated the one person, one vote standard protected by the Voting Rights Act because the population of Brooklyn, the city’s largest borough, was six times that of Staten Island, the least populous. The decision had racial implications because the population of Brooklyn was 51 percent black and Hispanic, while that of Staten Island was 85 percent white. Determined to create a more representative municipal government, the charter commission of 1989 increased the size of the City Council from 35 members to 51. The assumption was that smaller, more homogeneous districts were more capable of representing the interests of a population that was growing more racially diverse. A districting commission appointed by the Council to accommodate the 51 new seats then deliberately carved out a Council district in Chelsea to represent gay residents, demonstrating the system’s capacity to change as the rules of the game did; but change came slowly. Between 1990 and 2018, minority representation on the Council increased significantly (from nine of 35 to 26 of 51 members identifying as African American, Latino or Asian), signaling that the change in the size of the chamber had the anticipated impact. The number identifying as gay grew from zero to five. However, the representation of women declined proportionately from 10 of 35 to 11 of 51 members, even while the Council has had two female speakers, one of whom is a lesbian (Christine Quinn), the other a Latino (Melissa Mark-Viverito). The present speaker of the council, Corey Johnson, also identifies as gay. The charter change had other, lasting impacts on the politics of the city. One was that it gave rise to a third-party movement inspired by a coalition of labor unions and designed to challenge an entrenched Democratic Party organization that was still dominated by white ethnic leadership. After several false starts, that movement eventually matured into the Working Families Party (WFP). The main task of the 1989 commission was to redistribute the powers of the once-powerful Board of Estimate. Subsequent charter commissions have tinkered on the boarders of those decisions. The results have been mixed. On the one hand, they have better defined the historic character of institutions to accommodate more precise democratic standards; on the other, they have attempted to make sense out of historic arrangements that never made sense from the start. The obvious big losers in the reallocation of 1989 were the borough presidents. Although the city comptroller lost his place on the board, he retained his authority as the city’s chief fiscal officer with responsibility to conduct financial and performance audits. With the demise of the Board of Estimate, architects of the ’89 charter had hoped that, while preserving the strong mayor model, the City Council would emerge as a viable check on the power of the executive. That has not occurred; but I would argue that the outcome has less to do with the charter and more to do with day-to-day politics occasioned by shared agendas and amicable relationships between principal actors. A few cases in point: Speaker Peter Vallone worked relatively well with Mayor David Dinkins as the city struggled through post-fiscal crisis budgets overseen by state monitors. Although the relationship between Vallone and (the now unrecognizable) Rudolph Giuliani could be tense at times, the two agreed more often than not on key citywide priorities. Quinn was reliable ally of Michael Bloomberg; and Mark-Viverito joined Bill de Blasio in celebrating the final arrival of the kind of progressive government that the ‘89 charter portended, with WFP endorsements playing a supporting role. Ironically, if there were ever a noticeable tension between the legislative and executive chambers at city hall, it is apparent right now between Johnson and de Blasio. Nobody would have expected it after 12 years of Bloomberg, but there is a new progressive dissensus operating now, characterized by agreement on most big issues, but competition to determine who can better don the progressive mantle. Not to be overstated, this tension does play out institutionally. The present charter commission, appointed months after the mayor selected his own charter panel with a more limited agenda, is a vivid illustration of that tension. I know of no other time in city history that the Council has used its legislative powers to appoint a charter commission. Throughout history, charter commissions have been customarily appointed by mayors or governors. In the past, mayors have often used such panels as instruments to aggrandize their own formal powers. Given its origins, and rumblings that have emerged from various actors on the current scene, it would not be surprising to me if the new government proposed by the sitting commission grants less power to the mayor and reassigns it to those other officials who brought the panel into being. That would not necessarily be in the best interests of the city. I would argue that the city of New York needs a strong, yet accountable mayor. I know that is a fine line to draw, but it is discernible. Although borough identity is important, we must be reminded of the U.S. Supreme Court decision that reduced the power of the borough presidents in the name of fair representation. As we look back on ’89, we must also pay more conscious attention to the role that the Council plays in representing the interests of distinct communities—a role I would say that has been neglected by previous charter commissions. A thorough examination of the charter requires a keener appreciation of the character of our governing institutions and the “spirit” of the people who are governed. That awareness is best informed by an understanding of history, which we will take up next. I would love to see the commission come back with something significant and logical, like perhaps eliminating borough presidents altogether. I am still learning the advantages and disadvantages of de-centralized city council (London has borough councils that act like our community boards but also have the power of landmarking and some zoning). But getting rid of powerless offices would be significant progress. I don’t think the Public Advocate has any value, either. We need the Borough Presidents to be a voice for their boroughs otherwise the two smallest boroughs, the Bronx and Staten Island, will be overwhelmed by the three much larger boroughs. Meetings of a school siting task force and Neighborhood Advisory Councils for each of the four proposed borough jails have been closed to the public.